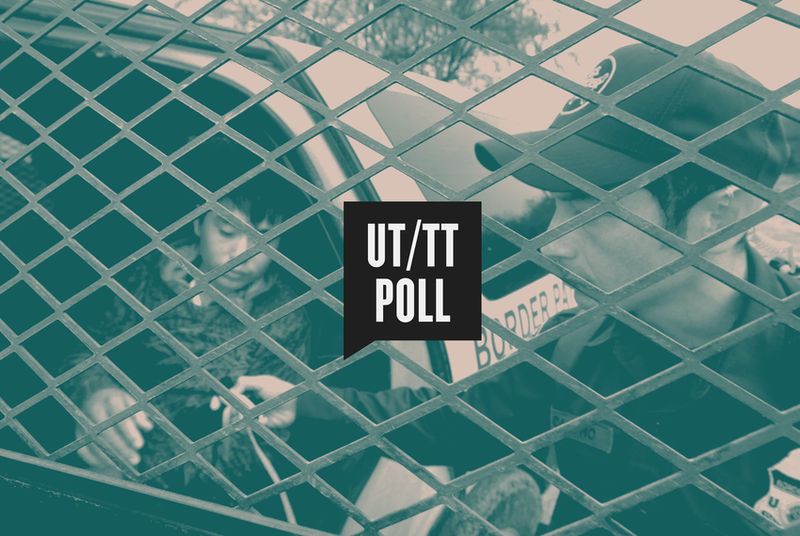 Texas voters would immediately deport undocumented immigrants currently living in the country and many want the U.S. to slow legal immigration, too, according to the latest University of Texas/Texas Tribune Poll. Most Texas voters would immediately deport undocumented immigrants currently living in the U.S., and 45 percent of them believe the country admits more legal immigrants than it should, according to the latest University of Texas/Texas Tribune Poll. Overall, 54 percent of Texas voters agreed that “undocumented immigrants currently living in the U.S. should be deported immediately,” while 46 percent disagree. Among Republicans, 81 percent agreed with that statement, while 77 percent of Democrats disagreed with it. A majority of white voters (61 percent) and black voters (51 percent) agreed, while 63 percent of Hispanic voters disagreed. “If you’re trying to be the party for a majority of Hispanics, it’s a bad issue,” said Jim Henson, co-director of the poll and head of the Texas Politics Project at the University of Texas at Austin. He added that many Republican officials in Texas have long tilted their rhetoric away from immigrants and toward border security to avoid sounding hostile to Hispanic voters. A quarter of the state’s voters think the U.S. allows about the right number of legal immigrants to enter the country right now, but 45 percent said too many are allowed to come in. Another 18 percent said too few are allowed. There are ethnic and partisan differences behind those overall numbers. Among Democrats, 34 percent said too few are admitted and 30 percent said the number is about right. Among Republicans, 66 percent said too many legal immigrants are allowed and 21 percent said current levels are about right. A slight majority of white voters (51 percent) said too many legal immigrants are allowed. Among black voters, 37 percent said too many were allowed; among Hispanic voters, 38 percent agreed. While 81 percent of Democrats said the Trump administration has gone too far in enforcing federal immigration laws, 57 percent of Republicans say the administration hasn’t gone far enough. Smaller numbers — 9 percent of Democrats and 30 percent of Republicans — said the enforcement levels have been about right. Among white voters, 32 percent said the administration has gone too far and 42 said it hasn’t gone far enough. Among black voters, 61 percent said it’s gone too far, and 9 percent said it hasn’t gone far enough. Hispanic voters are in between: 54 percent said the government has gone too far, and 23 percent said it hasn’t gone far enough. Overall, 41 percent of Texans said enforcement has gone too far, 20 percent said it’s been about right and 33 percent said it hasn’t gone far enough. The University of Texas/Texas Tribune internet survey of 1,200 registered voters was conducted from Oct. 15 to Oct. 21 and has an overall margin of error of +/- 2.83 percentage points. Numbers in charts might not add up to 100 percent because of rounding.